Map of eastern Europe in 3-4th century CE with archeological cultures identified as Baltic-speaking in purple and Slavic-speaking in light brown. 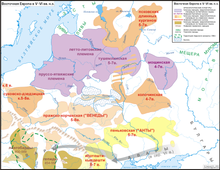 During the Migration Period in 5-6th century CE, the area of archeological cultures identified as Baltic and Slavic is becoming more fragmented. By the 7-8th century CE, the Slavic territory was greatly increased after Slavic migration and expansion (in the context of Migration period). Drevani, in Lower Saxony, Germany. Moravians, in Záhorie (Slovakia) and Moravia. Ancestors of Slovaks and (modern) Moravians. Nitran Slavs (or Slovene), in Slovakia and Northern Hungary. Ancestors of Slovaks. Ukrani, in Uckermark and Vorpommern-Greifswald, Germany. 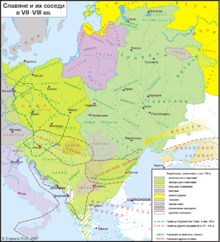 The South Slavic tribes descend from the Antes and Sclaveni, and predate the medieval identities formed after the Great Schism.